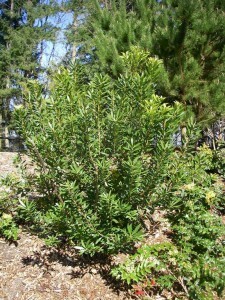 Names: The Pacific Wax Myrtle is still mostly known in the trade as Myrica californica. Morella is probably derived from “Morus,” the Latin name for mulberry, giving it a literal meaning of: “little mulberry.” It is also known as California Wax Myrtle, California Myrtle, or Pacific- or California Bayberry. Relationships: There are about are about 35-50 species of Bayberry formerly included in the genus, Myrica, which has now been split into different genera (most were assigned to the genus, Morella). About five Morellas are native to the mainland North America, including the Northern Bayberry, Morella pensylanica, known for its use in candle making. 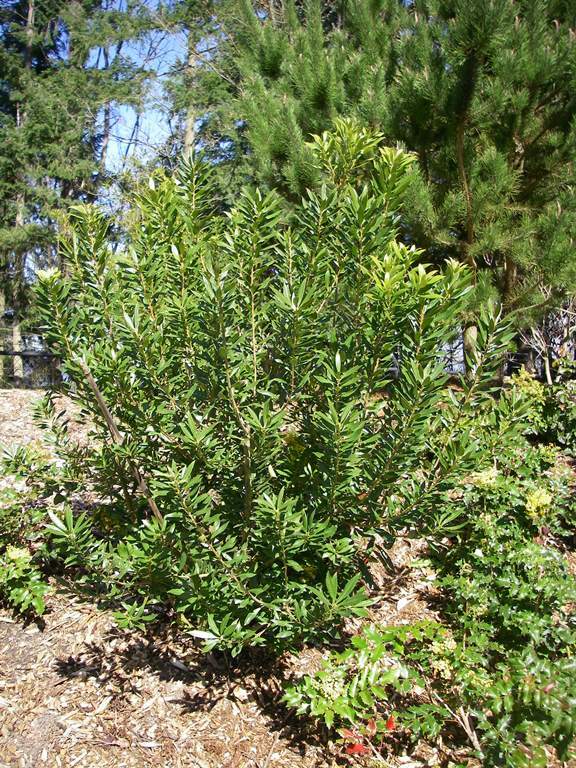 Distribution: Pacific Wax Myrtle is found along the Pacific coast from Gray’s Harbor, Washington to southern California, with an isolated population on Vancouver Island. Growth: It grows at a moderate rate to 10-30 feet (3-10m) tall and wide, growing the tallest away from fierce sea winds. 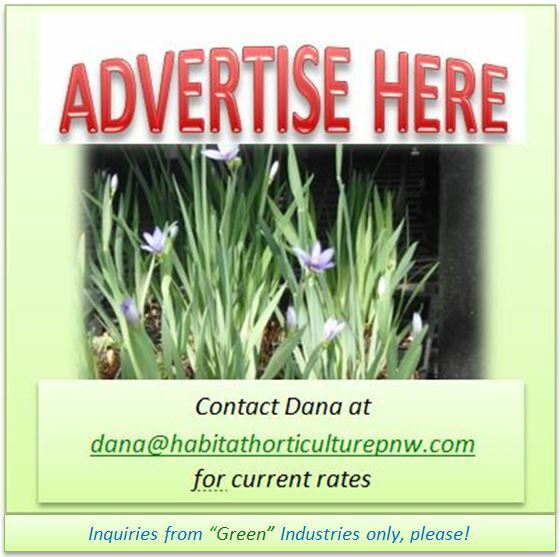 Habitat: It flourishes near the coast, along streams and on sand dunes. Wetland Designation: FACW, Facultative wetland, it usually occurs in wetlands but occasionally occurs in non-wetlands. 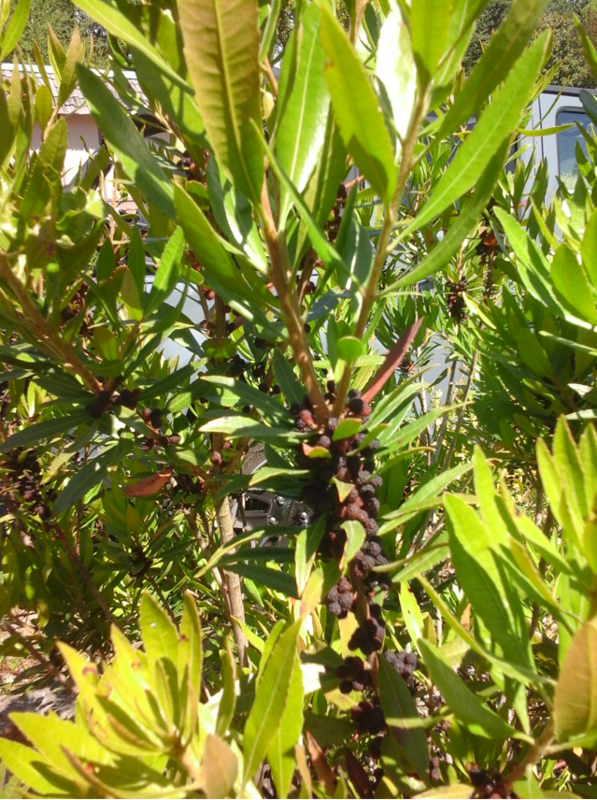 Diagnostic Characters: The leaves of Pacific Wax Myrtle are a bright, glossy green with black dots, pleasantly aromatic, pointed at the tip, with occasional teeth along the margins. The flowers are tiny, but the fruit is attractive in clusters of dark purple, bumpy berries. 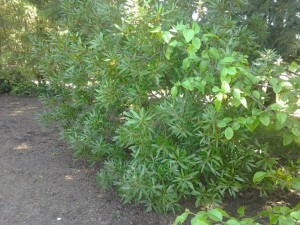 In the Landscape: The Pacific Wax Myrtle is our best native shrub for screening. 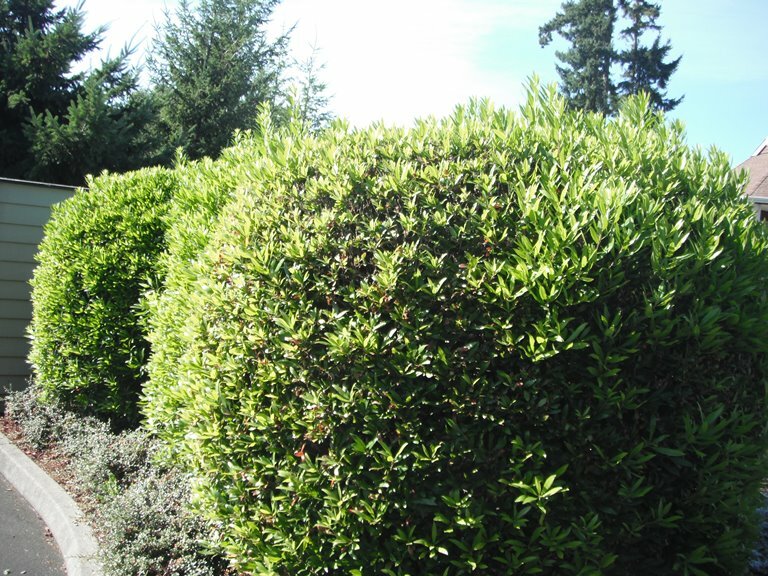 Several can be trimmed into a hedge or it can be mixed with other evergreens to create an informal screen. 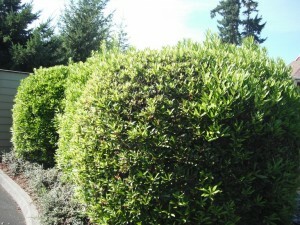 It is an ideal choice for coastal plantings due to its tolerance to salt spray. 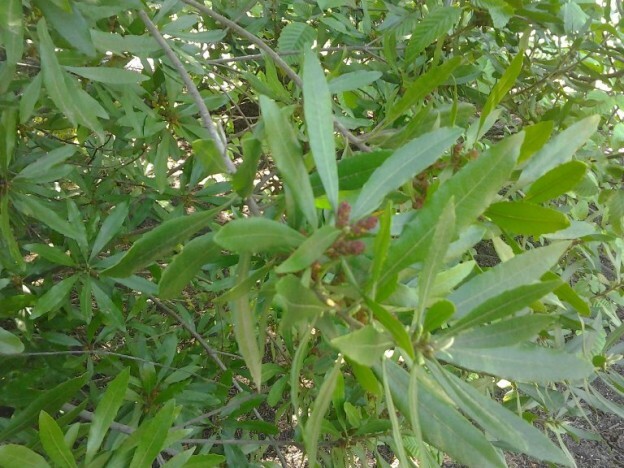 Wax Myrtle also is able to fix-nitrogen in association with the bacteria, Frankia sp., making this shrub especially useful for habitat restoration in soils with low fertility. Phenology: Bloom Period: May-June. Fruit ripens November. Propagation: Seeds collected in fall should be abraded or soaked in warm water to remove the waxy coating; they then require 3 months stratification at 40ºF (4ºC). Heel cuttings of half-ripe wood in July or August reportedly have fair to good success. Layering in the spring is the quickest method. Use by People: Although Pacific Wax Myrtle is related to the Northern Bayberry, attempts at boiling the fruit to extract wax produces so little, to make it hardly worthwhile. A gray-brown or maroon-purple dye may be obtained from the berries. Although the wood is reported to be heavy, very hard, strong, brittle and close-grained, this species is different than the Oregon Myrtlewood, Umbellularia californica, (AKA California Bay Laurel) used for artistic endeavors found in gift shops all along the Oregon coast. Use by Wildlife: The fruit is eaten by many kinds of birds, most notably the “Myrtle” (Yellow-rumped) Warbler, but only in small quantities. 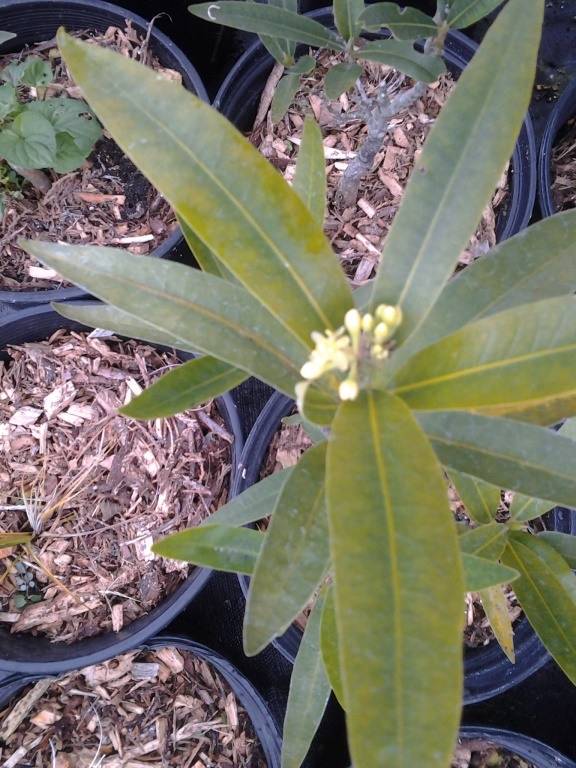 California Bay Laurel, Umbellularia californica, is another good evergreen for screening. 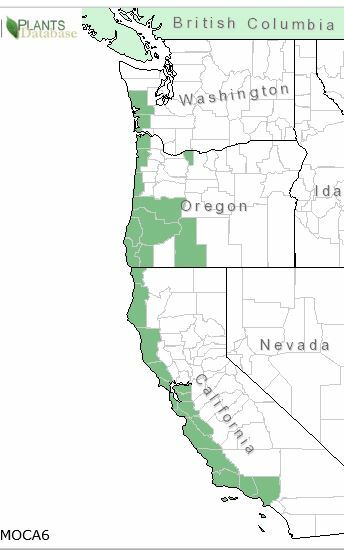 Other names include: Myrtle (Oregon, Pacific, Black, White, Yellow); Laurel (California, Coos Bay, Mountain); Bay (Laurel or Tree or Green Bay); Cinnamon Bush, Pepperwood, Spice Tree, California Sassafras or California Olive. It is found near the southern Oregon Coast and in California. It is a relatively slow growing, gumdrop shaped shrub to 25 ft (8m) high and wide, but may become a tree, to 75 ft. (25m) in forests. It can be grown in sun or shade and can be clipped into a hedge. The leaves are extremely aromatic and can be used (in moderation) as a cooking herb. 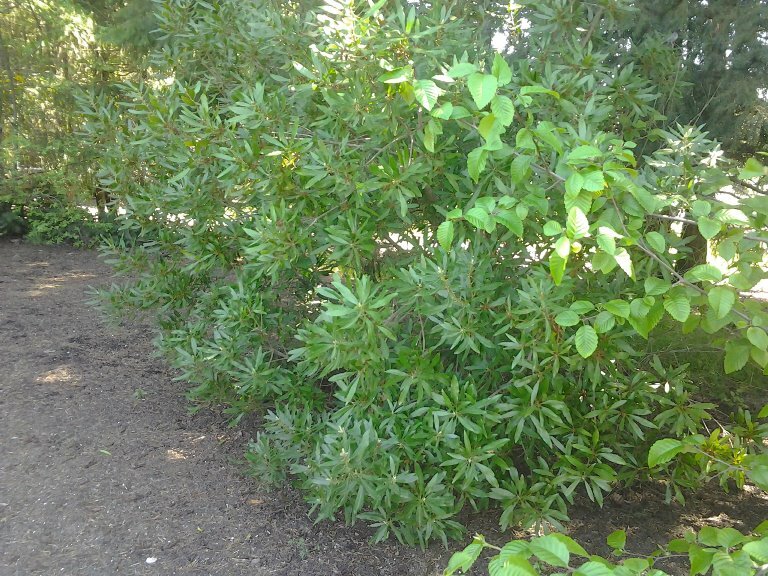 Caution: California Bay Laurel is the main host of Sudden Oak Death syndrome; make sure to inquire about the source and the health of the stock when purchasing these plants.